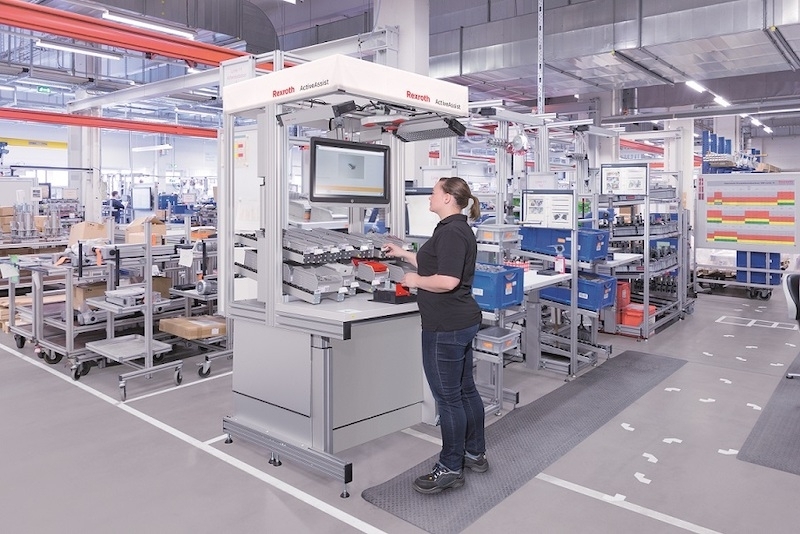 Jan. 8, 2019 - Bosch Rexroth places the focus of Industry 4.0 on people: with the ActiveAssist assembly assistance system, Rexroth is combining its years of experience in the fields of lean production and ergonomic workstation design and is expanding on this pioneering Industry 4.0 intelligence. ActiveAssist is freely configurable software, which connects physical assembly workstations to the virtual world. In combination with sensors, touchscreens, cameras and projectors, the comprehensive assistance system guides employees through the work steps with precision and makes varied assembly tasks down to batch size one a reality. ActiveAssist, the open software solution, is another building block on the road to the factory of the future in which employees are supported in their tasks by connected solutions. The assistance system identifies the workpiece by RFID or barcode and loads the required work plan immediately are then projected directly onto the work surface using a projector and the correct grab container is marked. This guides the employee step by step through the workflow and all of the information is ergonomically positioned in the field of vision. The employee’s movements can also be tracked via 3D cameras, making it possible to automatically confirm individual work steps. Modular: ActiveAssist has a modular design in both software and hardware and is freely configurable. Users can equip each assembly station with different assistance functions. In addition, the open software incorporates sensors from various manufacturers. With starter kits for different functional expansion stages, Rexroth guarantees a simple needs-based start-up as well as shorter set-up times and also provides a cost-optimized all in one solution. Connected: ActiveAssist uses a web-based software and is a flexible and open system thanks to standardized interfaces. This guarantees global access and allows numerous systems and assembly stations to be thoroughly connected. All data can be processed in real time and the right information is taken to the right place at the right time.